This is my second post in my Using Picture Books With Older Readers series. All the lesson ideas in this series are designed for use in middle school, but they could be adapted for high school or elementary as well. Today's lesson ideas are updated from a post I did several years ago and feature two picture books about proving the strength of bridges to a skeptical crowd. Both go great with the popular STEAM and makerspace movements in schools. These titles came out within a year of one another, and both are about the same event: the public opening of New York's Brooklyn Bridge in 1883. The bridge enabled people to cross the East River more quickly than going all the way around, but some citizens were afraid that crossing wasn't safe. How much weight could it really hold? Showman P.T. 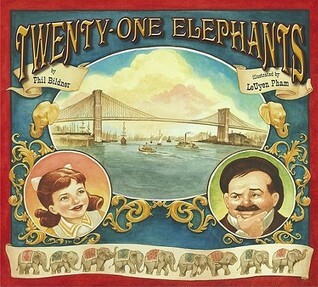 Barnum decided to advertise his traveling circus and took his 21 elephants, led by Jumbo, his most famous elephant, across the bridge. STEAM--Build card houses! Students LOVE doing this. It's a fun way to engage their inner-engineers and get their minds working! This video is about a man setting a world record for building card towers. STEAM--Bering Strait Bridge. View video below and discuss the problems involved in building a bridge connecting Asia and North America at the top of the world. Why would a bridge here be useful? Is it worth the cost and risk to build?